Discuss round 23 as it unfolds in the comments. 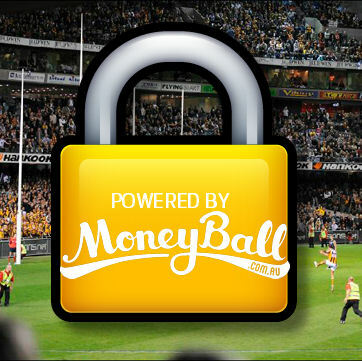 Proudly brought to you by moneyball.com.au. Shags is fulla @#it.He posted a question who to field and none were in his team. Wakka. stuck with a dilemma. aaron hall is my vice in elite and treloar captain. thinking about trading out biggs (league is gradual lockout) to someone not playing a taking my benchs lowest score, making the non player captain so i get hall. is it worth it? thoughts appreciated. bench is gibson, broadbent, selwood and k.jack. wont get selwood will i? In all honesty, he’ll like be similar to Ethan Hughes of this year, meaning he will be irritating for people in Elite Drafts. As long as Stef and Rocky score reasonably well I’m right on track to win all of my four grand finals. It should have been five, but two weeks ago in the only game i needed to play i made the bad decision of putting the C on Danger instead of Rocky. Roo just had an 87 point 2nd qtr with 11 marks. Got to be some sort of record. Can we just take a minute to appreciate the fact Nick Riewoldt just got 87 in the second quarter? Happily, he’s in my team. He could crack 200. Still pushing for top 2k AF.see everyone next year..
Saint Nick!!!! My Dreamteam Norm Smith medalist. The final is in the bag off his back. Been a epic year. Thankyou everyone on this site. And espically Roy, Calvin and Warnie. When you have a side of 22 premos, you try and find the weakest link. On recent form it was a toss up between Zorko and Steven. Nick Riewoldt – what a champ! You have done my Grand Final Team proud!! !